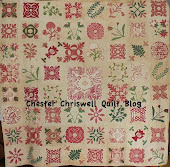 I finished making all the extra blocks for my Chester County Criswell quilt this week. Some of the blocks in the quilt are repeated and since I have chosen to make my quilt more like the original I decided to go ahead and make the extra blocks so I would be up to date when the new year starts in September. I went ahead and washed this years blocks and removed the starch and glue that I used to prepare the pieces. 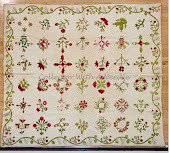 Teresa from Fabric Therapy has an excellent post today about the process of removing Roxanne's glue from your fabric. This is basically how I remove the glue from my blocks. The only thing left to do is square the blocks up to the correct size. I haven't decided how I want to layout my quilt and I really hate squaring up appliqué blocks so I will put this off as long as possible. I also managed to get the binding on my Scrappy Cheddar Squares quilt. I used wool batting in this quilt and I really like the way it makes the feathers stand out. If you would like to read more about how I made Scrappy Cheddar you can go here and here for previous posts. I hope you found some time to stitch this summer. I do love your Criswell blocks!! So lovely. And your scrappy cheddar! Bright and cheerful!! Just right to cuddle under!! Your Criswell blocks look so pretty all lined up in rows! Won't be long and the new pattern set will start. Wow! You have been so prolific making all of those CCCQ blocks, I thought my iPad was seeing double as I was scrolling down LOL they look great altogether. Your CCC blocks look wonderful! thanks for the tip about washing off glue - I do worry about the long term results of leaving it there. The cheddar quilt looks so lovely on the stand - love it! Your Criswell blocks are beautiful Looking at your collection may inspire me to make more blocks than I have planned to make. 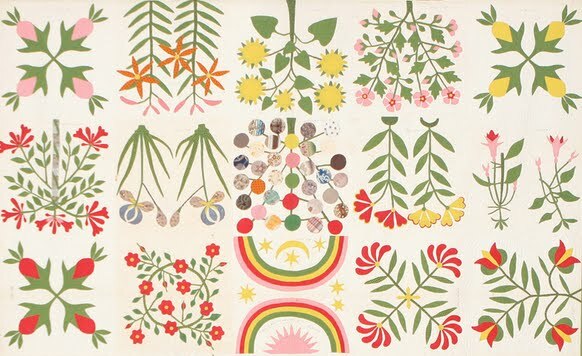 What a great appliquer (sp?) you are! Nancy, those CCCQ blocks are pretty impressive- you've made more than I have! It's great to see them side by side. 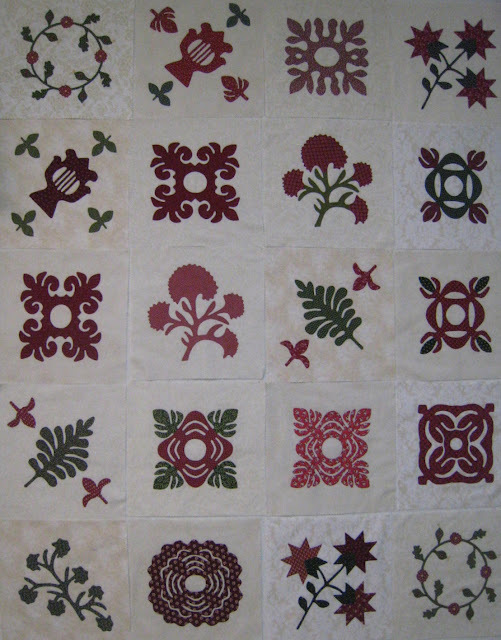 Your Scrappy Squares is great too, I love making scrappy quilts. The quilting suits it too. Wow! Your appliqué blocks are awesome. It's going to be a beautiful quilt, and the scrappy cheddar is warm and fun! Love them both.